LISBON, Portugal -- NATO's new Strategic Concept adopted at the Lisbon Summit on Friday has not outlined clear-cut membership prospects for Georgia and Ukraine. 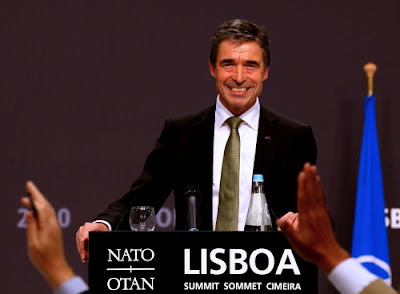 NATO Secretary General Anders Fogh Rasmussen addresses to media during a press conference at the first day of the NATO summit in Lisbon. The new 11-page document has confirmed the commitment of the Alliance to enlargement with new members but is nowhere near the mentioning of MAPs (membership action plans) such as the ones provided to Albania, Croatia and Macedonia (whose accession was later vetoed by Greece) at the previous summit in Bucharest in April 2008. The document hails the effect of NATO enlargement on peace, stability and freedom in Europe, and confirms the "open-door" policy with respect to all European democracies sharing the same values as the members of the Alliance. With respect to Georgia, however, which under the leadership of President Mikheil Saakashvili is a staunch NATO ally, and Ukraine, which shifted from a pro-NATO to a pro-Russian course after Viktor Yanukovich won the presidential elections there in February 2010, the Concept speaks of cooperation rather than potential accession. This cooperation is expect to happen through the Georgia-NATO Commission and the Ukraine-NATO Commission. The Lisbon Summit did confirm that the cooperation with Georgia and Ukraine must be based on the decisions of the Bucharest Summit in 2008. Back then Georgia and Ukraine (then under pro-Western President Yushchenko) got a murky political declaration that they can become NATO members in the future. Even though the Bush Administration was said to be in favor in granting MAPs to the two Black Sea states back then, the decision not to do so has been attributed to Germany and France who were fearful of upsetting their good relations with Russia.